Laajasalo has historically been an area of villas from the 50’s where local residents enjoyed a lifestyle connected to nature and water. The character of Laajasalo evolved in tandem with maritime life the way it was represented in the Belle Époque; today’s Laajasalo is the new active connected city part next to the sea. Laajasalo is to this day unique in the larger Helsinki area in offering opportunity to live in close proximity to a variety of maritime activities, public and private services, education and health, as well as outdoor opportunities in the woodland forest of the island. Laajasalo is the embodiment of Sustainable Living: it is a place where one can live, work, and enjoy the mixed use opportunities of both city and nature. 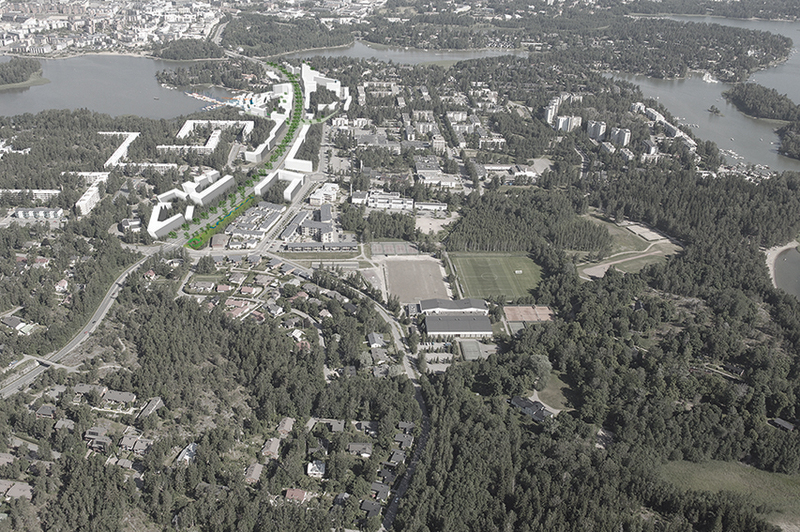 We provide a productivity-related context, where the existing landscape and its qualities, the views to and from the waterfront, and the need for new housing for the city of Helsinki and its growing population, are brought together in a multimodal, adaptable, and liveable way. This redevelopment for Laajasalo re-orientates the coming development towards the waterfront; introduces opportunities for mixed uses in all buildings; prioritizes shared space and pedestrian mobility; and weakens the automobile character of the boulevard by creating three axis to the waterfront. Our design’s maritime theme exists in a variety of scales: upon entering the site with a car, bus or tram one first sees the masts of the sailing boats that are parked in the marina area; while one is walking around the island they have the feeling of connectedness of nature with the water and a clear feeling that one is on an island; with the great variety of trails and walks around the site one can get a series of views towards the waterfront and water experiences. All parts of the production cycle are part of the urban fabric. Some examples are the seaside nurseries for oysters and kelp – the raw materials are refined in Laajasalo’s productive spaces and acquired for consumption by both restaurateurs and inhabitants alike. The waste is then taken care of by other parts of the productive network and brought back into the recycling loop as fertilizer and mulch. As production becomes an integral part of people’s everyday life, a new connection and understanding is born. The proximity of the whole life-cycle of production gives people in Laajasalo a deeper understanding of the needs and patterns of transforming tangible inputs into a final product. Best one yet. More buildings that are not just cubes or just sleeping cells. Something that will create local shops to be alive like in this apparently they have tried to make fishing village next to the harbour which is usually a very lively place full of stores and restaurants. I agree with previous comment. Most of other are more art without any concrete suggestions. This offers something for the future and develops the area, as it should. I would like to see some high buildings in replacement for old Laajasalo shopping center, which would support this really well. This is the one! I live on the island and this is the only plan that respects the environment and unique feeling of the island. We don’t want a bigcityfeeling, it must stay modern and cozy. I hope this is chosen. Tämä tuntuu alueelle parhaiten sopivalta ehdotukselta, jossa luonto ja alueen muut asukkaat on otettu huomioon. This seems truely to be the only one where there is a will to preserve the feeling of the area. However it is hard to get full picture of the actual plan. 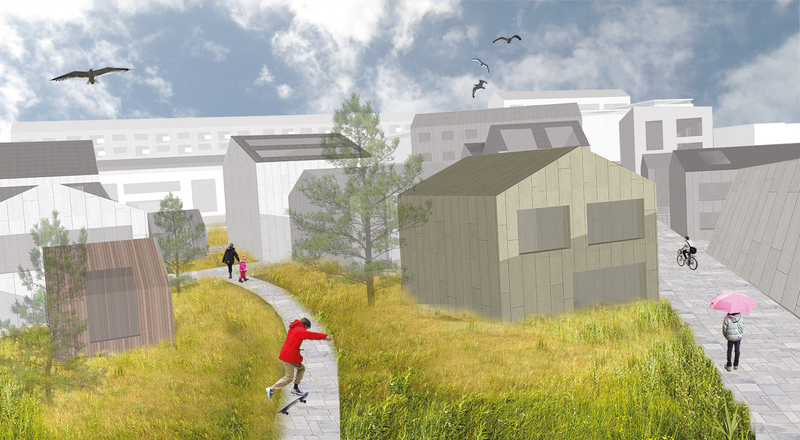 And yet there are some nice ideaa in other proposals considering vastaa from center to bay. Preserving active harbour for sailboats as well should be priority when archipelago/maritime-feeling is valued. Pineforest is if great value to locals and plans that preserve it show good taste. Laajasalo should be allowed to keep it’s uniqueness of nature and sea truely belonging to everyday life of inhabitants. Tästä puuttuu selkeä asemakaavapiirros. Tuo pieni havainnekuva ei kerro tarpeeksi rakennusmassojen sijainnista. Vaikuttaa sitä, että satama-alue olisi umpeen rakennettu?